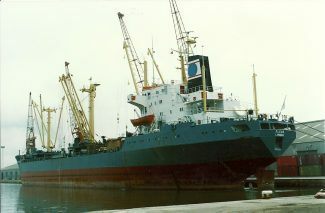 The bulk carrier FLEUR in Tilbury 2 4/3/87 RWJ? 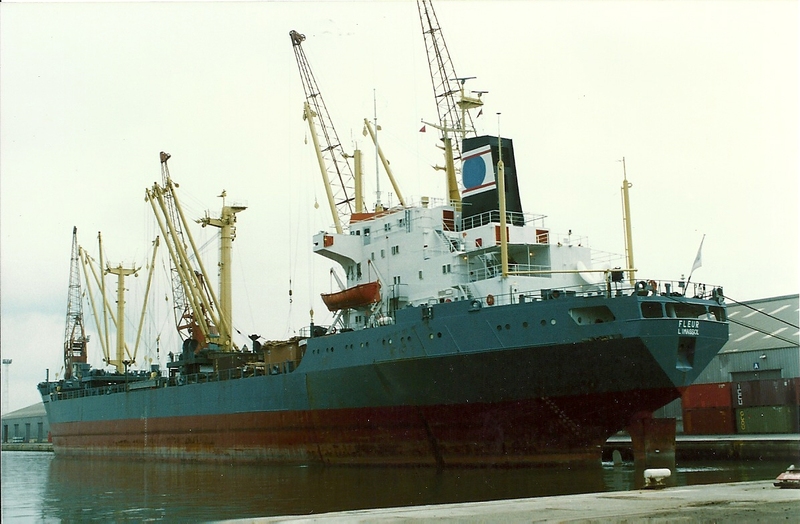 The SD-15 type general cargo vessel FLEUR (9403 tons gross; 15,138 deadweight), was completed at Sunderland in 1970 as SUNVREELAND under the German flag. She spent many years under German control, and when photographed in Tilbury was owned by Fleur Shipping Co Ltd, of Cyprus, a subsidiary of Fisser & Von Doornum, of Hamburg. She was named FLEUR during 1981-87, and in 87 was sold to become the Liberian-flagged FLAIR (not much paint needed for the new name on the hull). After that she had three more names and three more owners and was last reported as the Chinese (PRC)-owned DONG DA. She dropped off the radar and was thought to have been broken up in China during 2001-05.